The Buddhist Archive of Photography was the first major initiative of the Buddhist Heritage Project. 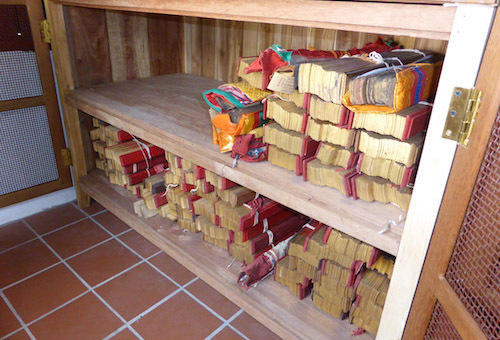 In 2005, stemming from long discussions between Pha Khamchan Virrachittha and Hans Georg Berger (Co-founders of the Buddhist Heritage Project) it came to light that in a number of monasteries in Luang Prabang, and certainly in Pha Khamchan's monastery of Vat Saen, there were large collections of photographs, often dating from the late 1800's or early 1900's. With a grant from the British Library's Endangered Archives Programme (funded by ARCADIA) Hans Berger brought together a small team of talented and interested young Lao, and embarked upon assembling a remarkable collection of more than 35,000 photographic images in various forms. Each was cleaned, identified, digitized, catalogued and professionally stored. 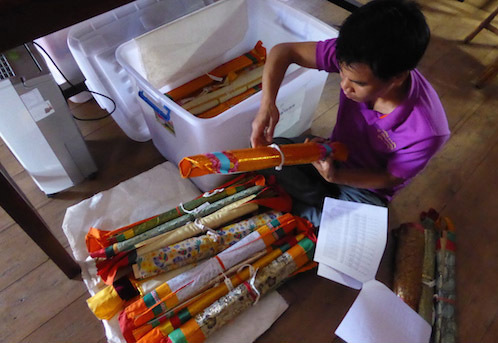 Several international experts were invited to participate and became involved in the evolution of the Archives, advising on correct handling, cataloguing and storage procedures of the material, and in the training of young Lao to continue the work. The Archives' focus has now expanded, thanks to a further grant from the British Library and the commencement of an extensive research program involving the Asian - Afrika Institute at the University of Hamburg, Germany and DORISEA. The Archives are now treating large collections of historic traditional palm-leaf manuscripts, modern manuscripts documents, diaries and personal papers. Each is being digitized, catalogued and preserved in the same manner adhering to international professional standards. Major support from a number of institutions, including the Badur Foundation of London and the U.S. Ambassadors Fund for Cultural Preservation has assisted in restoration of the Archives' physical working spaces and in the storage and cabinetry required to maintain the collections to international standards. 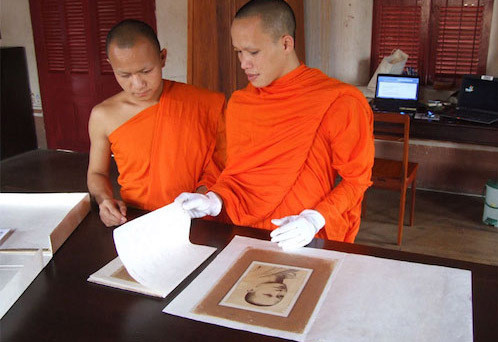 At the Buddhist Archive of Photography, Pha Khamlar, a monk involed with the Archive since its inception, examines an Archive photograph with one of the Novice scholarship interns. 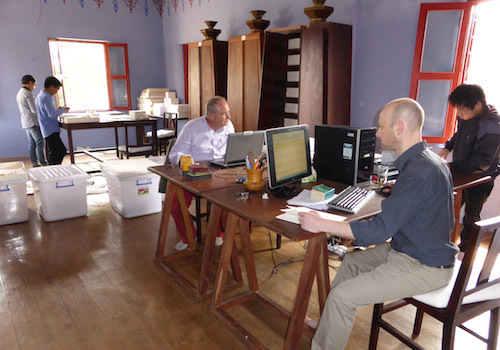 Hans Georg Berger, co-founder of the Archives, and international expert Martin Juergens, Conservator of Photographs, work with the Archive's Lao staff during the re-installation of the collection following renovation of the building. 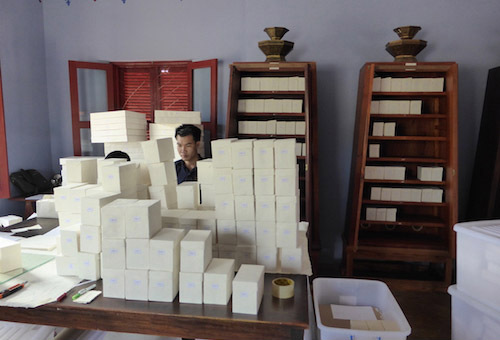 During the re-installation the Archives' Lao staff meticulously places the thousands of photographs into carefully catalogued and listed acid-free Sa Papaer boxes, especially made for the purpose in Luang Prabang. 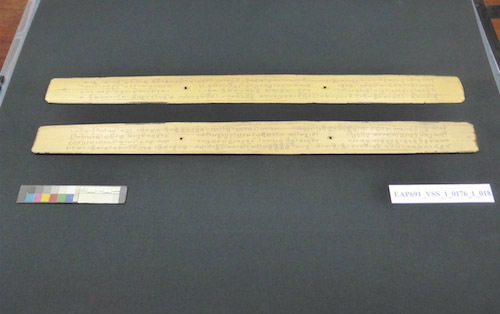 During the Manuscrip Preservation, Digitisation and Catalouguing programme, funded by the British Library's Endangered Archives Programme, these manuscrips have come from one of the Temples and await examination. An Archives' staff member carefully removes silk-wapped manuscripts from their transportation box in preparation for their transcription, cataloguing and digitisation. Folios from an historic palm-leaf manuscrip laid out on the photgraphic image table, with idetifying labels and a colour reference chart, in preparation for the digitisation and cataloguing. 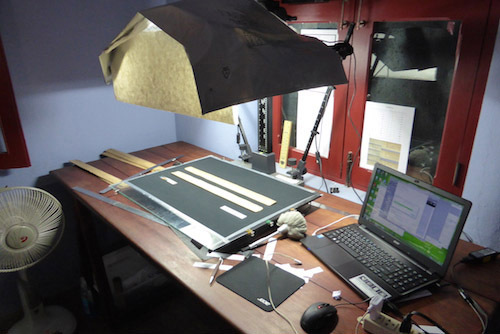 The phoographic workstation where a high end digital carema (under the light hood) is used to capture the digital image of manuscrip folios, according to strict guidelines which meet the British Library's Endangered Archives Programme standards. 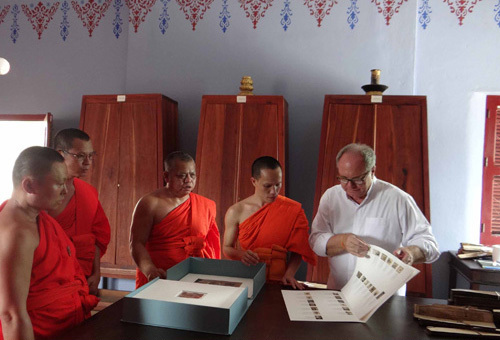 Senior monks from Vientiane, invited to visit the Archives by Satthu Nyai One Keo Sitthivong (centre), Chairman of the Buddhist Sangha of Luang Prabang, view an important portfolio of images drawn from the Archives' collection with Hans Georg Berger. 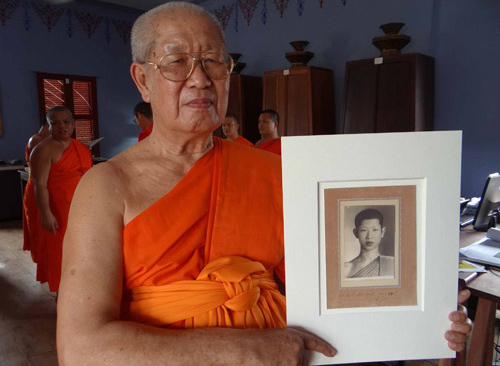 Pha Bounpheng, a senior and respected monk from Vat Saen Soukhaham, holds a studio photo of himself at the age of 17 now in the Archives' collection. A generous Grant from the U.S. 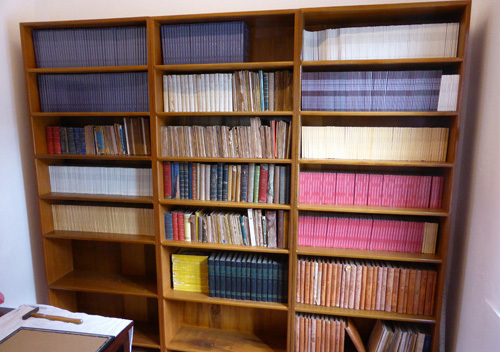 Ambassadors Fund for Cultural Preservation enabled the Archive to constract much needed Cabinetry, Sa Paper Storage Boxes for the Photograph collection, and Library shelving. At the Grant signing ceremony; seated in the fron three senior Abbots, from left Satthu Bounpheng, Satthu Bua and Satthu Khamlar; standing at rear, U.S.Ambassador Daniel A. Clune and Mrs. Clune (centre) are flanked on the right by Brian Lingham of the Project and on the left by senior Embassy staff.